All barbet species perch and climb well and have the two toes forward, two toes back foot structure that allows for an especially good grip on wide branches. This is a grasping or perching rather than climbing foot, and in climbing a near-vertical branch the outer toe may be swung forwards or sideways to give a better purchase. Barbets do not support themselves on their tail feathers, as do woodpeckers, except during brief spells when they are excavating their nests. Unlike woodpeckers, barbets do not have a long, thin, sticky tongue that can be extended and inserted into ant nests, although a few woodpecker species share the brush-tipped tongues of many barbets. The bill is stout and strong, quite stubby but solid in the smaller species and rather elongated and pointed in the bigger ones. It usually has several tufts of bristles at the base. These can be flattened against the bill and opened up to avoid damage when the bird is pecking or excavating wood, but their precise function is unclear. Some barbet bills are extremely like toucanet bills, the cutting edge of the prominently grooved upper mandible being saw-toothed, but barbet bills are not flattened nor usually keeled in the same way as the larger toucans' extravagant beaks. In many species they are nevertheless used in displays, being brightly colored or contrastingly pale against a dark face. marked, uniformly dark brown for the most part. 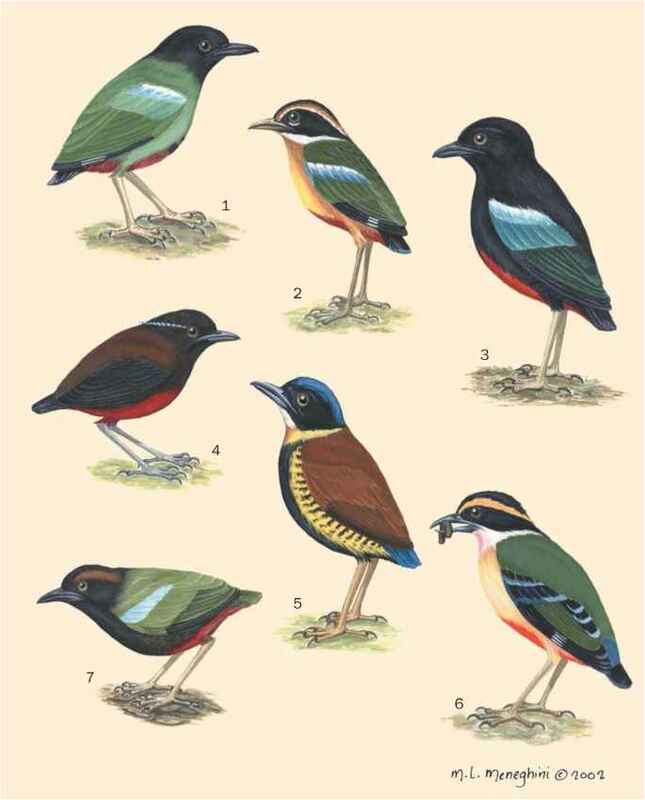 The tin-kerbirds of Africa, small and secretive birds of thick foliage, are often strongly patterned, striped black and white or with patches of red or yellow on the head, and vivid orange or yellow rumps: these color marks are often reflected in their names. Asian barbets include many lovely green species, with patterns of red, yellow, purple, brown, and blue in complex bibs, caps, cheek marks, spots, and bars. South American species are often gaudy and differ in appearance from the rest, despite sharing the usual color palette of black, white, red, and yellow. A number have orange breast shields or red breast bands. 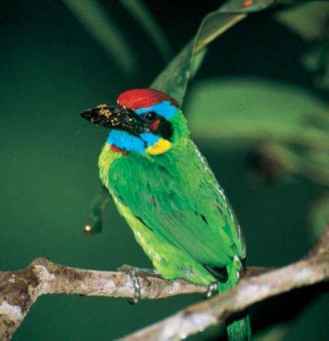 One genus, Eubucco, contains several small species that are predominantly bright green above, bright red on the head, and red or yellow beneath, topped off by pale yellow bills.